McKee foods, a family-owned maker of cakes and cookies with such “Cosmic Snack” brands as Star Crunch, Cloud Cakes and Cosmic Cupcakes, has launched a promotion with Rancho Obi-Wan to give away a tour of Rancho during a trip for four to San Francisco as well as 12 different collectible Rancho Obi-Wan trading cards randomly packed in specially-marked boxes of Star Crunch. Little Debbie has been a long-time supporter of Rancho Obi-Wan, providing annual donations and making sure guests have an assortment of Little Debbie snacks to choose from on the tour. The company came to Rancho Obi-Wan’s Steve Sansweet last year and suggested offering a trip as a prize. 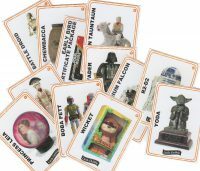 Shortly after, the idea of a small trading card set featuring items from Rancho’s vast collection was added. The promotion was approved by Lucasfilm Ltd. and The Walt Disney Co. and the work began. 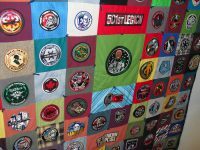 From a list of about 50 Star Wars collectibles, the folks at Little Debbie narrowed the field down, with suggestions from Steve, to represent various types of items, eras and movies. 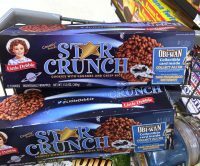 Everything was approved late last year and the special Star Crunch boxes have started appearing in stores all over the U.S.
It’s easy to enter the sweepstakes for the trip. No purchase is necessary and you can enter once a day online. See details on the Little Debbie website. The last date to enter is May 31, 2017. Please read the rules carefully regarding age and location of entrant and other specifics. Amy Sjoberg and Earl Bonequest stock up on Little Debbies! The Grand Prize Winner will get a private tour for four people of the museum at Rancho Obi-Wan, home of the Guinness World Records certified largest collection of Star Wars memorabilia in the world. The Grand Prize includes coach round-trip air transportation for four; four nights at the Fairmont San Francisco Hotel and other amenities.